January 9, 2018 January 9, 2018 Dan O.
Can’t deny what they make movies about, right? A medical student by the name of Michael (Oscar Isaac) meets a beautiful dance instructor Ana (Charlotte Le Bon) in late 1914 and the two instantly fall in love. Well, sort of. He falls for her, head over heels, but she already has a boyfriend, an American photojournalist named Chris (Christian Bale), who is dedicated to exposing the truth. However, the one thing keeping them together and united is their Armenian heritage and in the time they live in, it matters most. Cause as the Ottoman Empire crumbles into war-torn chaos, all three must have to put their differences and passions aside to ensure that they save one another and help out those who need it the most. A lot of the positive reviews about the Promise seem to highlight the fact that it isn’t perfect, it’s a little messy, and oh yeah, it’s a bit of a faulty-look at the Armenian Genocide, but is being made and should be praised for nonetheless. In some regards, I see this, understand this, and agree with this; whereas most Hollywood studios would like to turn a blind-eye to such a catastrophe like the Armenian Genocide, especially since the Turkish government still refuses, to this day, to actually admit it happened, the Promise is the rare exception. It’s made, it’s got something to say, and it’s there for the whole world to see. How could a girl deny that beard?!? Does that mean that they should see it? Probably not, good intentions and all. The one issue of the Promise, no matter what it tries to do or say, is that it all revolves around this love story and that’s just hard to get past fact. There have been countless movies that have used real-life tragedies to star-glossed, passionate and heated love-affairs (Titanic, the Impossible), but the reason why those kinds of movies have, for the most part, worked, is because their attention to the tragedy is well-known and the romance is actually something to get behind. 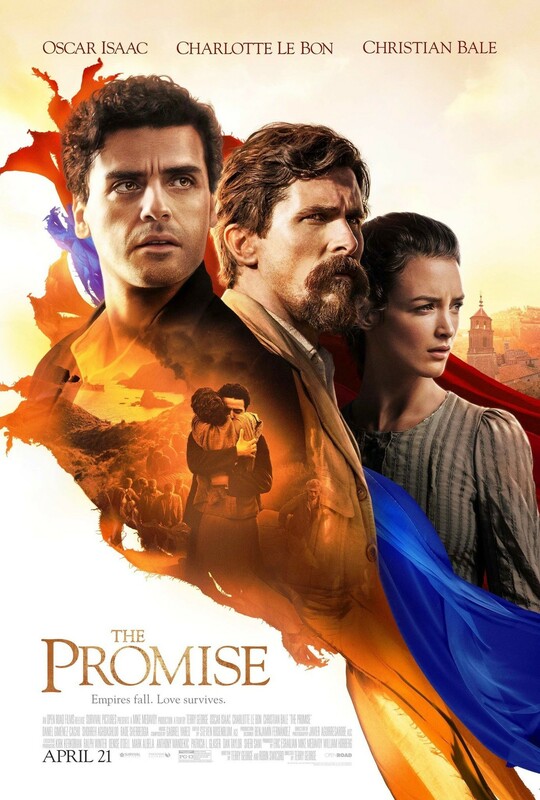 While the Promise does pay an awful-lot of attention to the tragedies of the Armenian Genocide, it also spends nearly as much to a love-triangle that, in all honesty, just never works. It never registers because the whole time, we know that the Armenian Genocide is going to happen, it’s going to take over the story, and we’re not really going to be all that concerned with whether they live or die; we’re way too busy worrying about all of the countless others that are going to hit their graves already. It’s why the Promise, try as it might, just doesn’t work – it’s romance is lame and the fact that co-writer/director Terry George spends so much time on it, shows that he was trying to play center-field, and not only appease the studios and audiences who wanted a love story, but also dial down on the Armenian Genocide stuff, too. What the set of Exodus: Gods and Kings should have liked look, but nope! Aka, the stuff that really counts and needs to be talked about. And it’s a shame, too, because the trio of leads here all do their best, but the screenplay is sometimes so cheesy and melodramatic, they almost never have a chance of surviving it. Oscar Isaac turns in perhaps his possibly first bad performance as Michael, as he’s saddled with an Armenian accent that seems to go in and out; Christian Bale is interesting as Chris, the journalist who wants to expose the truth, but also feels so made-up, that it’s hard to see him as anything more than “a type”; and Charlotte Le Bon, as the object to both of their affections, is charming and pleasant, but once again, is given a dull-role as the woman who everybody loves and falls over for. It’s probably what happens to her everywhere she walks in real life, but it doesn’t feel like the right time, here, in this movie. There’s clearly bigger issues to discuss and drop over. Consensus: Despite the legions of ridiculous deniers, a movie based in-and-around the Armenian Genocide like the Promise, is a step in the right direction, but with such a weak script and love-story surrounding it, there’s still plenty of room for improvement.